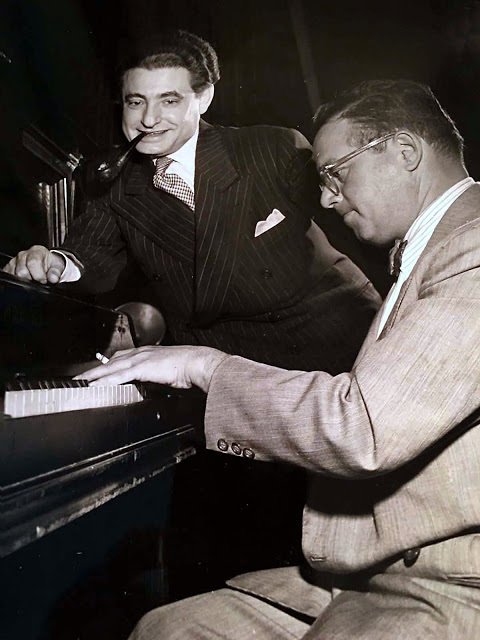 Lyricist Leo Robin with composer Jule Styne working together on the score of Gentlemen Prefer Blondes at the time of the original production in 1949. 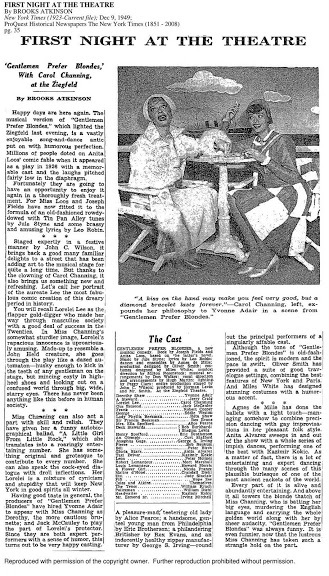 A review of opening night, “First Night at the Theatre,” by Brooks Atkinson, which appeared in the New York Times on December 9, 1949. 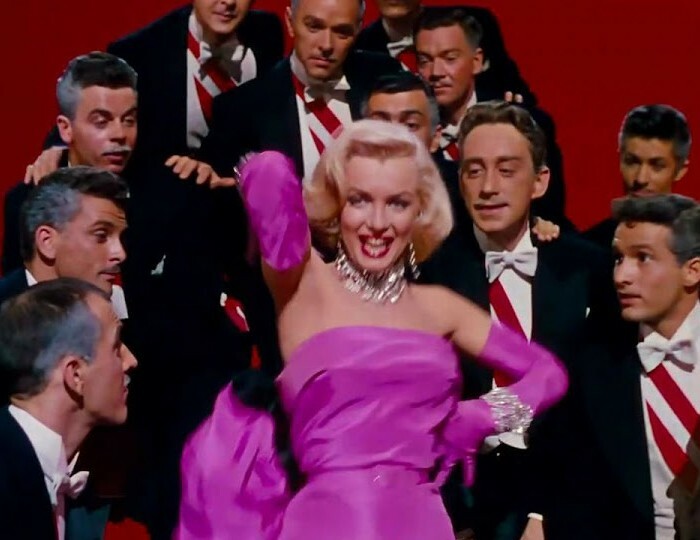 Backstage on the set of Gentlemen Prefer Blondes in 1949. From left to right: Carol Channing, Alice Pearce, lyricist Leo Robin, show producer Herman Levin, and other members of the cast -- Manny Sachs, Eric Brotherson, Jack McCauley, and George S. Irving listening to Jule Styne at the microphone. 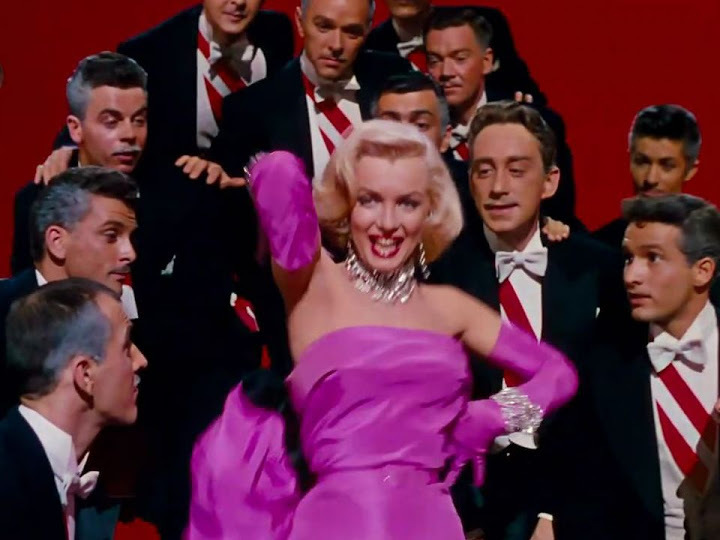 Marilyn Monroe singing "Diamonds Are a Girl's Best Friend" in the 1953 film adaptation of Gentlemen Prefer Blondes. 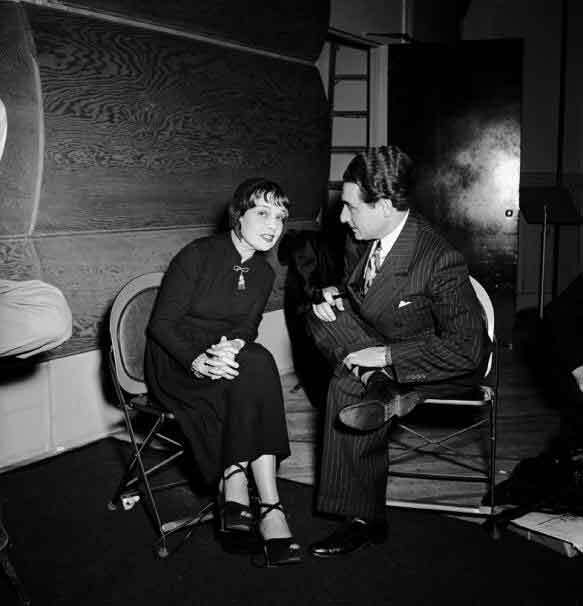 Lyricist Leo Robin with famed author Anita Loos who wrote the 1925 best seller Gentlemen Prefer Blondes. 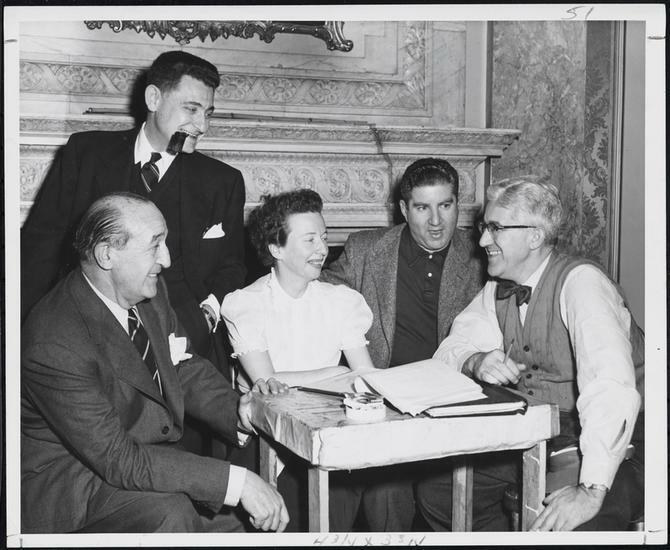 She along with Joseph Fields wrote the script for the 1949 musical. 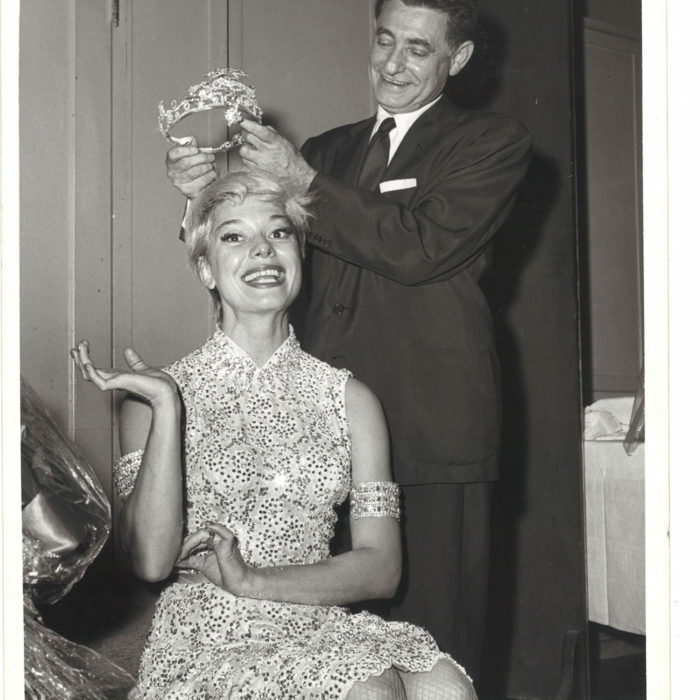 It opened on Broadway at the Ziegfeld Theatre where it ran for 740 performances. 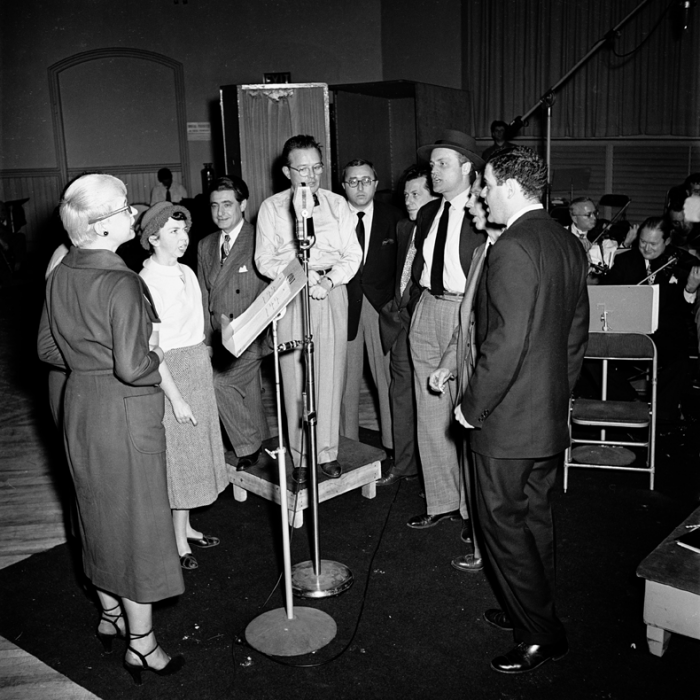 Jule Styne and Leo Robin wrote the score. 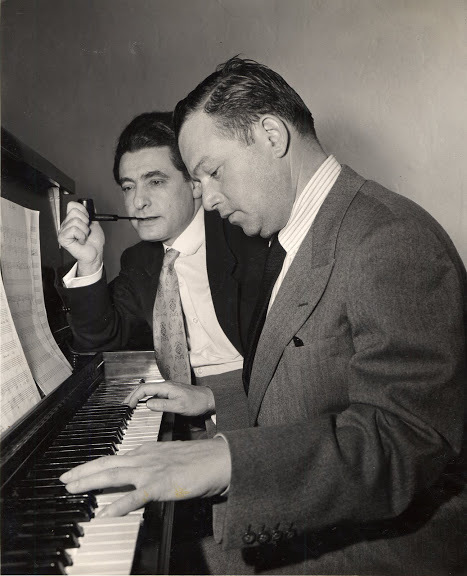 Lyricist Leo Robin with composer Jule Styne in 1949 working on the score for Gentlemen Prefer Blondes. 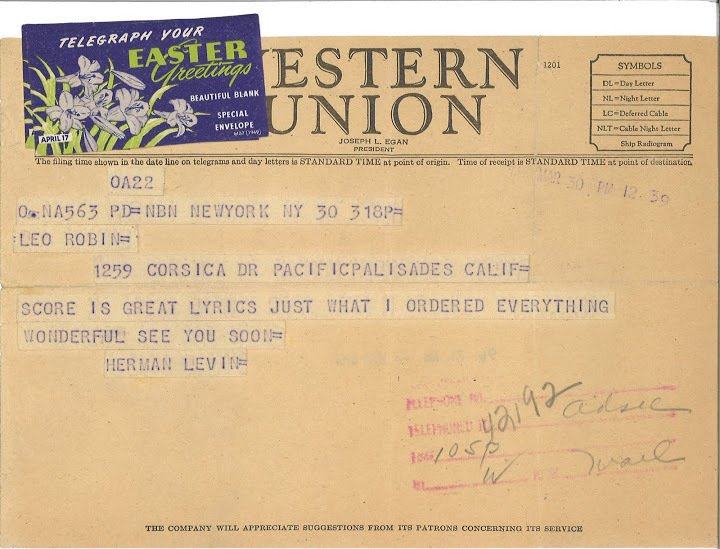 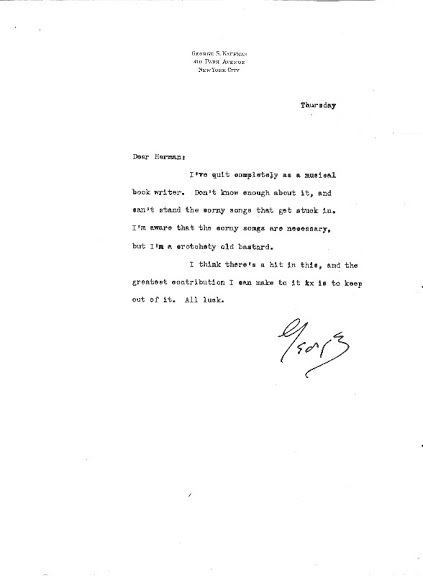 Herman Levin’s telegram to Leo to tell him how perfect Leo’s lyrics were for Gentlemen Prefer Blondes. 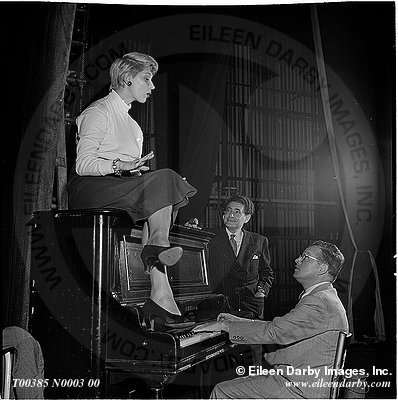 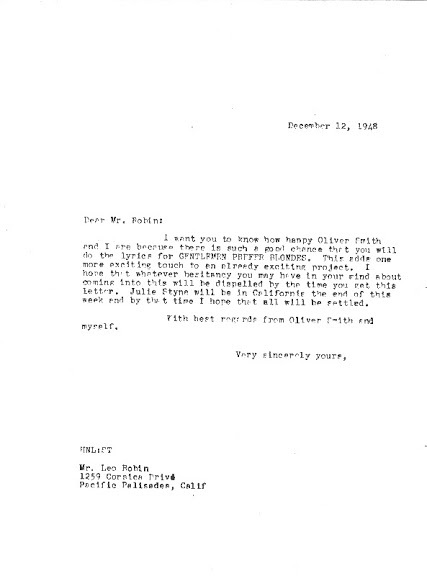 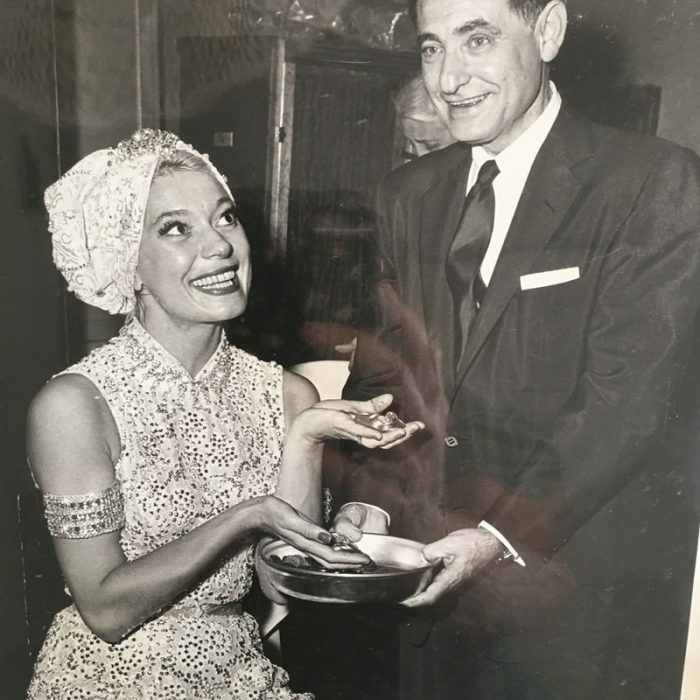 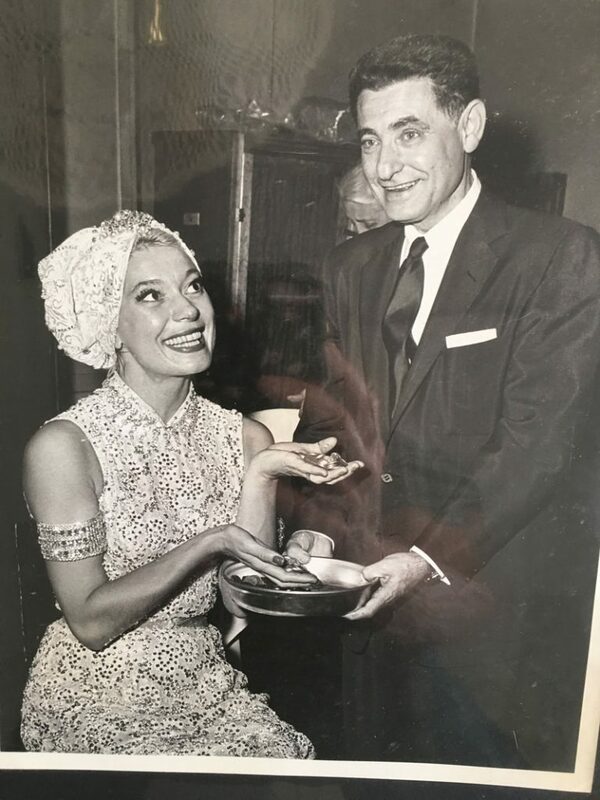 Behind the Scenes: Jule Styne sent a telegram to Herman Levin, dated October 17, 1948, recommending either Leo Robin or Yip Harburg (who wrote the score for The Wizard of Oz) to write the lyrics for Gentlemen Prefer Blondes. 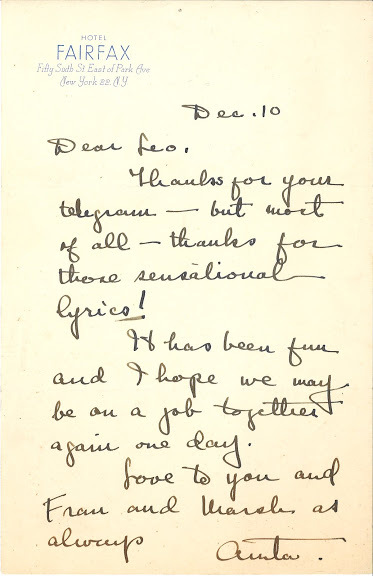 Behind the Scenes: Herman Levin’s letter to Leo Robin, dated December 12, 1948, expressing his delight at the prospect of Leo coming on board to write the lyrics for Gentlemen Prefer Blondes. 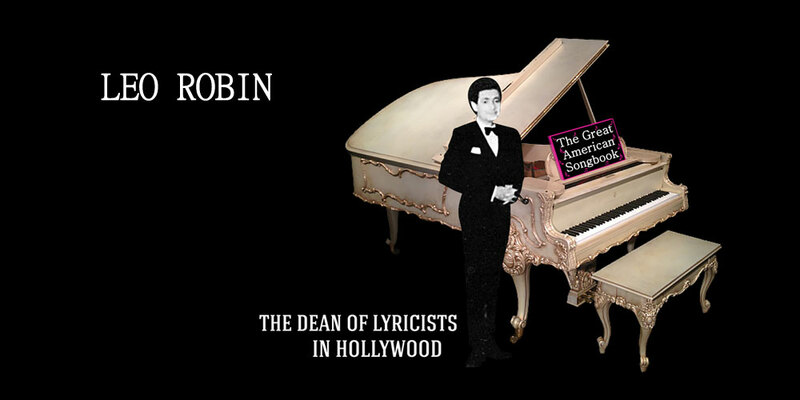 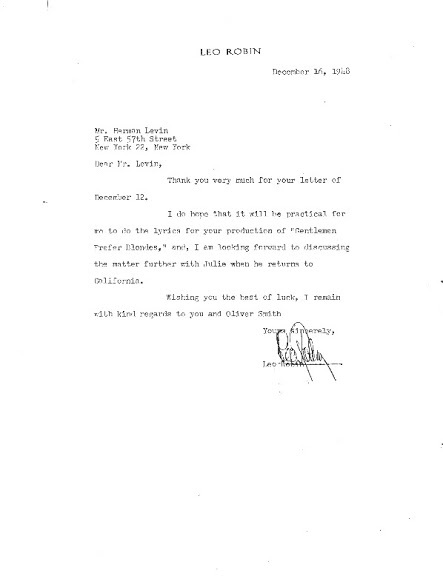 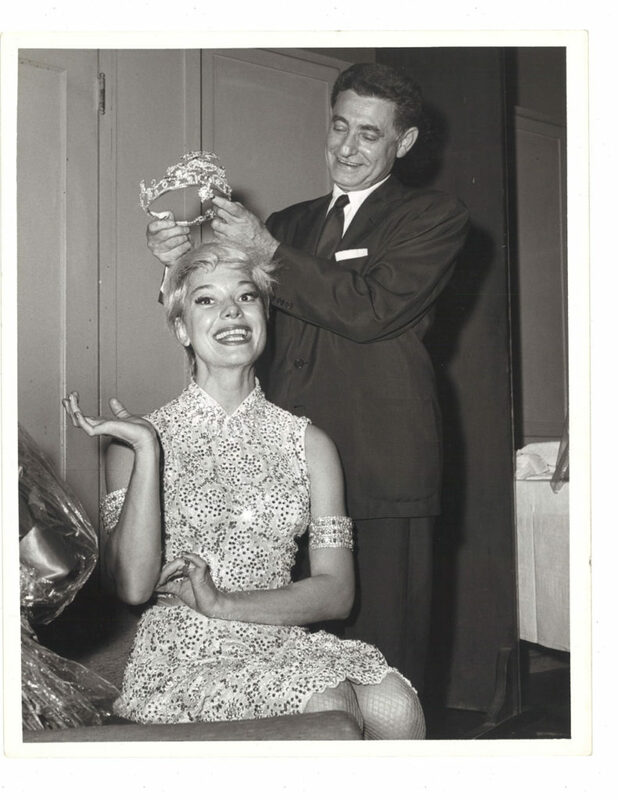 Behind the Scenes: Four days later, Leo Robin replied, favorably, to Herman Levin, to discuss writing the lyrics for Gentlemen Prefer Blondes.